Description: Large rounded chestnut head, black breast and tail, gray back and sides. Bill is blue with a black tip, and a white stripe behind the black tip. Females uniform brown, black tip at end of a pale bill. 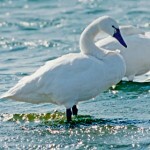 Habitat: Breeding birds prefer larger marshes with both open areas and stands of emergent vegetation. 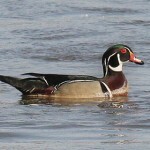 Where in Nebraska: Common, locally abundant, regular spring and fall migrant accross the state. 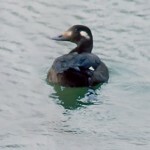 A common regular Breeder in the Sandhills region; breeding much less frequent in the Rainwater Basin. Field Notes: Divers, like the Redhead, require larger lakes and reserviors with extensive marsh habitat along the borders. 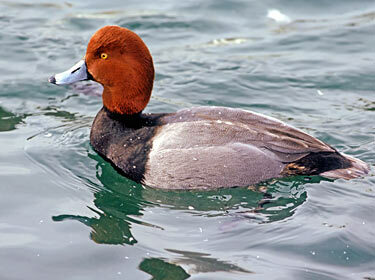 Fun Facts: Redheads are parsitic, in that they lay their eggs in the nests of other ducks including other Redheads, however, many of these laid eggs fail to hatch.